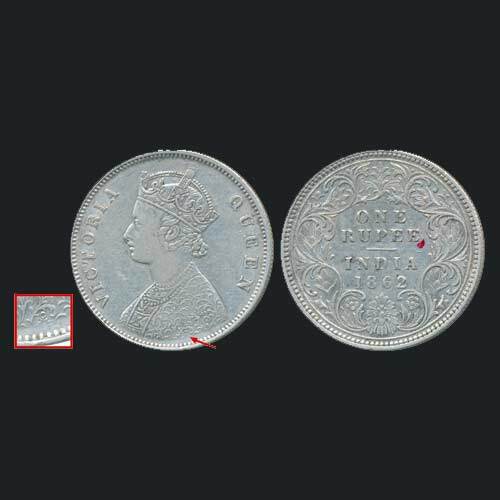 This silver rupee of Queen Victoria design is considered to be one of the most prominent discoveries amongst the British India rupee. This coin was issued in 1862 from the Calcutta mint during the British rule in India. The obverse of this coin depicts a bust of Queen Victoria facing right, the design which makes this coin a rare specimen is the ‘JCL’ inscribed in the triangular form on the jabot, it can be seen in the above-shown image. The design of the bust is different in terms of its details, such as the central panel below the necklace and crown. This coin is an unlisted and unpublished variety, only five specimens are known of this type. The initial that appears at the bottom of the bust is believed to be the engraver's initials. The first appearance of this coin was brushed out as fake. Later on when many specimens across the country were located the authenticity of this coin slowly began to be accepted. A coin discovered from the lot find in Mumbai from a safe deposit locker nailed this authenticity and made these coins a jewel of collectors collection. Todaywalla Auctions sold this coin for INR 2, 20,000 in Ahmadabad after the increased popularity and demand for this coin type. To know more about British India coins click here.